Small spaces: Elegant neutral living room, featured in Domino, upload feito originalmente por xJavierx. 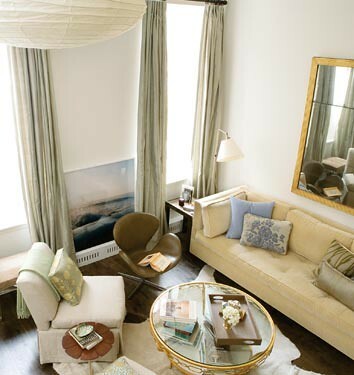 he combination of neutral fabrics, round and square shapes, and tailored upholstery in this beautiful small living room. What the Domino editors say: "Create a furniture plan that works with your space. A small rental apartment doesn't have to be glorified a dorm room: An elongated sofa, a pair of neutral slipper chairs, and elegant floor-to-ceiling drapes create an urbane feel." Photo by Eric Cahan, Domino, March 2006.